We are currently looking for home gardens in Marin to feature on next spring’s Bay-Friendly Garden Tour. This annual event showcases beautiful and inspiring gardens that use practices sensitive to our local environment. The gardens we want to feature incorporate sustainable elements such as low-water-use or native plants, urban food growing, permaculture, rain and stormwater catchment, composting, lawn conversions, graywater systems and more. Home gardeners and landscape professionals alike are invited to nominate a garden for the 2012 tour. The Marin tour will be on Saturday, May 19, 2012. To nominate a garden, contact Elena Freeman at (415) 945-1164 or efreeman@marinwater.org. 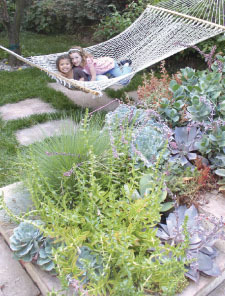 In previous years, the garden tour in Marin was known as the Eco-Friendly Garden Tour. This will be the first year we are joining forces with the Bay-Friendly Landscaping & Gardening Coalition in its 9th annual tour throughout the Bay Area. For more information on the Bay-Friendly Garden Tour and to find tour dates in other Bay Area locations, visit bayfriendlycoalition.org/GardenTour.shtml. Summer is here and that means the irrigation season is on. You want your garden to be healthy and beautiful, but do you know how well your sprinklers are doing? There’s help to find out. Master Gardeners are avid gardeners who have received University of California Cooperative Extension (UCCE) training in horticulture and want to share their knowledge about gardening and sustainable gardening practices. Through a partnership with MMWD, now in its fourth year, Marin Master Gardeners have received special training on water-efficient landscape methods. These volunteers are visiting homes within MMWD’s service area to offer advice on keeping your garden looking great while saving water. They will provide site-specific recommendations, including an irrigation system check and tips on plant selection and good soil management. The free visits take about an hour. Call 499-4204 to schedule your Garden Walk visit. 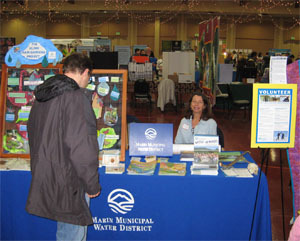 MMWD Conservation staff exhibited at the 34th annual Bay Area Environmental Education Resource Fair on January 22. This resource-rich event is designed for teachers, community educators, students and families. MMWD promoted the school education programs of our Watershed and Water Conservation departments. The exhibit hall at the Marin County Fairgrounds was buzzing all day as attendees visited over 50 local and Bay Area exhibitors, networking and picking up literature, posters, curricula and more. Meanwhile, a series of 16 workshops were presented on topics from “No Child Left Inside” to saving endangered plant species to The Bay Institute’s Students and Teachers Restoring a Watershed (STRAW) Project. If you missed the fair, see the BAEER website to learn more about the 2011 workshops and exhibitors, and visit MMWD’s website to discover our free water education programs for schools in our service area. And be sure to make plans to be at the BAEER Fair in 2012! Congratulations to the Marin Master Gardeners, who won a “Community Outreach” award at the National Extension Master Gardener Coordinators Conference in early October for a presentation by Master Gardener Karen Detwiler and a poster promoting the Garden Walk program. Garden Walk is an innovative partnership between the Marin Master Gardeners and MMWD. 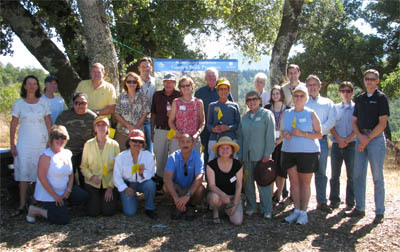 Marin Master Gardeners and MMWD Water Conservation staff at Garden Walk end-of-season recognition event. The beautiful, award-winning poster—created by Peggy Mathers, Pam Engel, Jill Fugaro, Patti Oji (artist), Steve Swain, Glenn Smith and Karen Detwiler—was on display last week at an end-of-season recognition event for the Master Gardeners who volunteer their time to make the Garden Walk program a success. Through the Garden Walk program, homeowners in the MMWD service area receive free information and advice to help them conserve water outdoors. During each on-site consultation, the Master Gardeners walk through the garden or yard and advise the home gardener on Bay-Friendly practices such as water-efficient irrigation, healthy soil management and water-wise plant choices. Marin Master Gardeners began offering “Bay-Friendly Garden Walks” in 2008 after receiving special training from MMWD Conservation Specialists. Approximately 100 home garden visits were performed this year. Although the Garden Walk program has ended for the season, the walks will start up again in Spring/Summer 2011. For more information contact (415) 499-4204. MMWD’s Ordinance 414 sets new standards for the design and installation of landscapes and irrigation systems to conserve our water resources. Join us to learn what Ordinance 414 means for you and how you can help your customers benefit from the very best water-saving technologies and practices. Leaking toilets cause more water waste than any other fixture in the home. Even a silent toilet leak can waste from 30 to 500 gallons of water per day! The ones you do hear can waste even more. As an MMWD Water Conservation Specialist, I regularly perform water-use efficiency surveys for customers through our Conservation Assistance Program. Last month I assisted a customer at a home in San Rafael who was very concerned about some increasingly high water bills. The property included a pool and hot tub, and every inch of the 1/3 acre property was irrigated. Even so, their average water use of 1,260 gallons per day seemed high for two people. The homeowner suspected the irrigation system had leaks. In the past rodents had chewed the irrigation lines. We made sure all the water-using fixtures in the house and the irrigation system were turned off, and then I checked the water meter. It showed constant movement at a rate of over 450 gallons per day! It turned out there were two silently leaking toilets. The homeowner was relieved to find out there was something that could be fixed to stop the high bills and the waste. Many toilets only run at night. That’s because most people are asleep at night and much less water is used during these hours, with a result that the water pressure in the supply system can rise considerably during this time. The rise in pressure can cause “water creep” inside your gravity-fed toilet tank by 1/2 inch or more. That is why toilet manufacturers normally suggest setting the water level at approximately one inch below the top of the overflow tube. When was the last time you checked your toilets for leaks and water level adjustment? It’s not hard to do. MMWD has an easy step-by-step guide to help you check your toilets for leaks and check the flow rates of all your indoor plumbing fixtures to make sure your house is water efficient. You can find the Do-It-Yourself Home Water Survey on our website. The Do-It-Yourself kit is also now available at the MMWD customer service lobby for customers without internet access. Visit us at 220 Nellen Avenue in Corte Madera to pick up your copy. Toilet dye tablets for testing toilets are also available there. If you would prefer to have one of our water conservation experts perform a survey for you, call us at 945-1523 to schedule a free appointment. A few weeks ago, this blog mentioned that now is a great time for planting spring-flowering bulbs. By request, here is some more information on planting and protecting your bulbs. Bulbs look best planted in clumps or drifts. To create a natural-looking effect, toss handfuls of bulbs into the air, then dig holes and plant wherever they fall. (Here’s a handy website for figuring out quantities and spacing when planting different bulbs.) Add some compost or worm castings to amend the soil, and mix some bone meal into the soil at the bottom of each hole to encourage strong root growth. To plant in an area that has dried out over summer (especially difficult with our local clay soils), wet the soil slowly and let it percolate so you can get a shovel or tiller in. Don’t try to work clay soil if it’s too wet or you can end up creating lumps that dry into hard clods. Cultivate the soil adding generous amounts of organic matter such as compost, manure, guano or worm castings to improve the soil structure and nutrients. If you have a problem with gophers or other rodents eating your bulbs, you can try sprinkling some red pepper powder in the planting hole. A more secure method is to plant your bulbs in a cage made of hardware cloth. The roots and stems grow through, but the rodents can’t get to the bulbs. You can create larger cages to accommodate multiple bulbs. Most rodents avoid daffodils and fritillaria. Now that you have protected the underground portion of the bulbs, you’ll want to protect the leaves and flowers from the other great garden predator: deer. Alliums (ornamental onions) are some of the most deer-resistant flowering bulbs. Other supposedly “deer-resistant” bulbs are Dutch iris, dwarf iris, crocus, daffodils, early stardrift, glory of the snow, and society garlic. 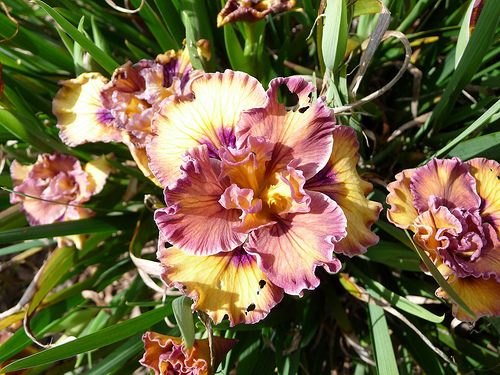 One of my favorite bulbs is the native Pacific Coast iris and the fabulous hybrids that come in myriad colors. For more information, check out the Society for Pacific Coast Native Iris at pacificcoastiris.org. Planting something now that doesn’t bloom for half a year is definitely delayed gratification, but when those bulbs you almost forgot you planted are in full bloom in the spring, it’s a big beautiful payoff. Summer has arrived, and that means “Garden Walk” season is also here! One of MMWD’s most popular water conservation programs, this is a partnership with Marin Master Gardeners, a program of the University of California Cooperative Extension. “Bay-Friendly Garden Walk” offers homeowners and renters a free, one-hour site visit by two UC-certified Master Gardeners who assess the landscape plants and irrigation components for water efficiency. A Garden Walk can help you find a leak, understand your irrigation controller and scheduling, improve soil health and water retention, and learn about water-wise plants. The Master Gardeners will give you ideas on how to incorporate Bay-Friendly principles in your garden, including saving water and energy, building healthy soil, reducing waste in the garden, creating wildlife habitat, protecting local watersheds and contributing to a healthy community. Call (415) 499-4204 to schedule your free Garden Walk visit. Join us this summer for these free, fun-filled workshops! Breakouts on soil, managing pests, and plant selection, where you’ll be introduced to the primary Bay-Friendly maintenance practices. Small group design activity to instill fundamentals and help with getting started on your own garden. In just three hours you will have multiple opportunities to practice techniques on-site and bring home resources to begin implementing lessons learned. To register for this free class, visit www.bayfriendlycoalition.org/Calendar.shtml#Marin. Saturday, July 31: Gardening from the Ground Up – a workshop on building healthy soil. Learn about soil components and amendments, composting, and sheet-mulching. Saturday, September 11: Go Native: Planting for Pollinators – an introduction to native plant selection.